Leave Delhi behind and head to this camp for some outdoorsy fun and adventure. With clean, fresh air, wide open spaces, and plenty of activities, this package will be a great day for kids and adults alike. 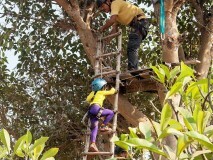 You'll have the whole day to try adventure activities like ziplining, Burma Bridge, ropes course and rock climbing. In the evening, you'll enjoy a bonfire with snacks, and then eat a delicious dinner before you retire to your tents. 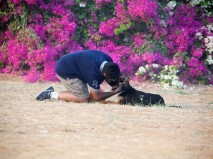 The camp near Delhi is the perfect place for a one-day picnic, a corporate getaway or a family get-together. The campsite is at Pahadi, near Damdama, close to the Gurgaon-Sohna road, making it easy to get to whenever you feel like avoiding a weekend in the city. 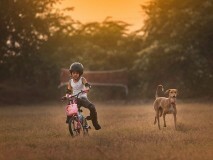 The campsite has excellent facilities for adventure activities, and trained staff to supervise each activity. 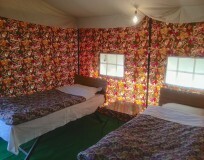 You'll be staying in deluxe Swiss tents equipped with double beds with all bedding, as well as attached washrooms. 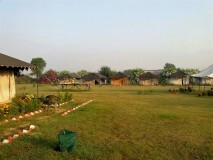 • Get away to this campsite near Delhi for a weekend of adventure. 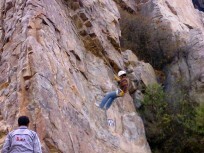 • Try your hand at activities like Burma Bridge, rock climbing, ziplining, and a trampoline. • Get away from the city for a short break. 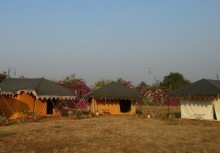 • Spend the night in Swiss tents at this adventure campsite near Delhi. This camping trip near Delhi involves some adventure activities, so if you suffer from cardiac or respiratory conditions, or spine or knee problems, please consult your doctor before booking. Participants must adhere to the rules and guidelines of the campsite at all times. For cancellations made 10 days before check-in to the camping trip near Delhi: 90% of the trip cost will be refunded., minus any transaction charges. For cancellations made 7-9 days before check-in to the camping trip near Delhi: 70% of the trip cost will be refunded, minus any transaction charges. For cancellations made 2-6 days before check-in to the camping trip near Delhi: 25% of the trip cost will be refunded, minus transaction charges. For cancellations made 0-48 hrs before check-in to the camping trip near Delhi: No refund. The costs for this camping trip near Delhi do not include unforeseen expenses due to natural forces, changes in weather, road blockages, illness, etc. Drivers, nannies or any other support staff will be charged INR 400 per person (excludes taxes) for three meals at the staff cafeteria. No accommodation is provided. The package for this camping trip near Delhi does not include mineral water, but filtered drinking water is available at camp. You can check in by about 11:00 hrs, and can begin the day's activities. 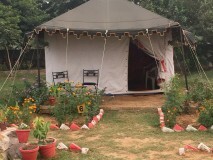 Do make sure you're on time so you can make the most of your time at this campsite near Delhi. You can choose from activities like Burma Bridge, trampoline, mini Flying Fox, and more. You'll take a break for a delicious before heading back to the adventures. In the evening, you'll sit down to enjoy hot pakodas and tea and coffee. When it grows dark, a bonfire is lit, and you'll be served snacks. At night, after dinner, you'll retire to Swiss tents, tired but happy. You'll wake up and can go for a walk. It's time for breakfast after that, and then it's time to pack up. You'll have to check out by 11:00 hrs. Your camping trip near Delhi ends here. Meals for drivers, support staff. 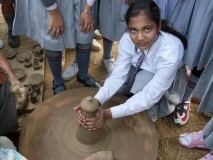 This can be arranged for INR 400 (excludes taxes) per person. • Please carry specific personal or prescribed medication. You can check in by 11:00 hrs, and will be served a welcome drink. After that, it's adventure time. You'll only stop for lunch (veg/non-veg) and evening tea/coffee and biscuits. By 19:00 hrs, the bonfire is lit, and you'll be served veg/non-veg tandoori snacks, as well as popcorn and masala peanuts. At night, you'll eat a hot dinner with veg/non-veg items. You'll retire to Swiss tents for the night. 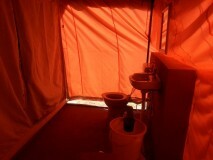 Each tent has a bed, all bedding, and an attached washroom. You'll wake up to a hot cup of tea or coffee, and then will enjoy a hot breakfast. By 11:00 hrs, it's time to check out. Trip ends here.